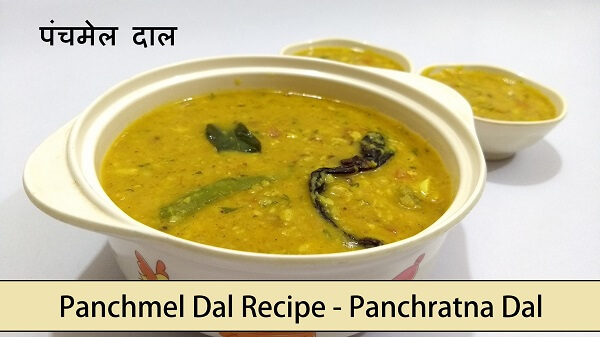 Panchmel Dal or Panchratna Dal or Panchkuti Dal Recipe, as the name suggests, made from 5 Dals (lentils) is a famous traditional Recipe of Rajasthan. Lentils Contain lots of protein and nutritious. 5 different Dals cooked together with spices. Tempering of cumin with Ghee (Clarified Butter) gives it a perfect rich taste and strong aroma you can’t resist. Mix all Dals in a bowl, rinse with fresh water couple of times. Soak dal in 1 & ½ cup water for 1 hour. After 1 hour, pressure cook dal for 4 to 5 whistles. Heat Oil and Clarified butter together in a pan over medium flame. Add Ginger, Garlic, Dry Red Chilli, Curry Leaves and Asafetida, sauté for 30 seconds. After 1 minute, add chopped Tomatoes & Sliced Green Chillies, mix well. Add all the spices (except Garam Masala), Red Chilli Powder, Turmeric Powder, Dhana Jeera Masala and Salt. Mix well and cook for 3 to 5 minutes. After 5 minutes, switch off the gas and add Garam Masala & fresh Coriander, mix well. Heat Clarified butter in a tadka pan. Pour the tadka into Dal, mix well. 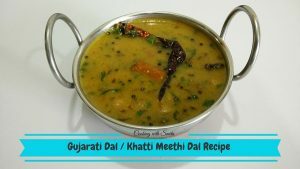 Rajasthani Panchmel Dal / Panchratna Dal is ready to serve. Serve with Bati, Roti, Naan or Rice.